The digestive system is not a garbage dump and it shouldn’t be treated that way. Yet the majority of North Americans are unaware of proper digestion. What happens when there is no longer any space to put the trash at the garbage dump? Eventually the trash has to be removed and possibly taken to another waste management facility. What about the body? When the body can’t dispose of its food easily, it can result in various digestive conditions such as food intolerances, leaky gut, acid reflux, bloating, cramping, ulcers, constipation, diarrhea, and liver burden. Bowel conditions such as diverticula, strictures, or bowel spasm and inflammatory bowel diseases such as irritable bowel syndrome and Crohn’s disease are the results of improper digestion. After all, if you’re not disposing of your waste, you will eventually get sick. However, making positive changes and practicing mindful eating allow you to get to the bottom of that waste and figure out what’s causing the issues. When you don’t make a change, you will continue to produce the same results. Once you fix the root causes of the conditions, you will be able to enjoy life, every day to its highest potential. People often can recognize when they are experiencing digestion problems but do they understand what a healthy digestion process is to begin with? When it comes to proper digestion there are many layers of healthy eating, including the proper breakdown of your food, with absorption, assimilation, and finally the elimination process. Understanding how to eat is important so your healthy eating doesn’t go to waste. While it eventually will become waste either way, you still want your body to benefit and absorb the nutrients in your food. Here are some mindful eating guidelines to help aid your digestive health. It all starts with the mouth. Spend an adequate amount of time chewing your food. It is recommended that you chew 30 times That may be hard for you considering most people often spend approximately an hour making a meal and then 10 minutes or less inhaling it. Enjoy your food, and savor every bite, indulging in the taste and texture with small bites. The final step is swallowing once your food becomes a liquid-like paste. Your mouth’s digestive enzymes can therefore break down heavier starches more efficiently. If your meal takes five minutes to eat, you didn’t really enjoy it, and it’s more difficult for your digestive system to process the larger chunks of food. When your have digestion conditions and diseases, your digestive system has been compromised, and your food can’t be absorbed. People will often continue living with minor digestive issues such as bloating, gas, acid reflux, and cramping. Until you deal with the cause, you will not benefit from healthy eating. Soothing and cleansing the bowels helps lay the groundwork for absorbing your healthy foods. You can gradually increase your diet’s fiber and coarseness once the bowel’s ability to absorb has begun. Eating easy to eat foods is the best way for this transition, such as broths, light soups, steamed or liquefied vegetables and fruits with a green smoothie, before a large raw salad. Eating raw foods containing live enzymes helps improve digestion as well. A “clean” diet is best for the digestive system. This typically would consist of as many whole foods as possible such as brightly colored vegetables and fruits, whole grains, legumes and beans, while eating probiotic foods daily. This includes foods that have been fermented such as yogurt, miso, tempeh, sauerkraut, and natto (fermented soybeans). When cooking with oils such as olive or coconut oil, heat at medium or low temperature. Coconut oil is especially helpful for digestion because it contains medium chain fatty acids, which put less tension on your digestive system. The medium fatty acids are immediately converted into energy from your liver, instead of being stored as fat. Another bonus is coconut oil can help with weight loss. It is normal practice among many cultures, and especially within Western society, to have drinks with meals; however, this doesn’t help digestion. The added fluids can dilute the digestive juices, which make it harder to breakdown your food. The best beverage to drink is simply water. It is best to drink less than one cup of water before or after your meals to help dissolve your food, which stimulates digestive juices. It is general practice to drink eight to 10 glasses of water a day, although you can drink less if you are consuming a higher amount of vegetables and fruits. Also, the combination of lemon juice and water helps flush out the kidneys first thing in the morning. Apple cider vinegar can be beneficial for digestion as well because of its high acidity content helping wash toxins from the system. Changes to your lifestyle will help with proper digestion. 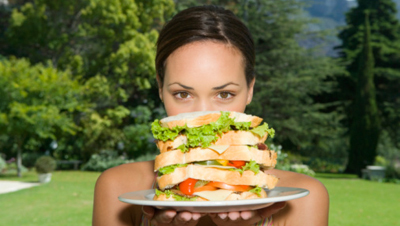 When we eat when we’re stressed, upset, or feel rushed, this impacts the digestive tract. Always aim to eat in a calm state of mind. Never eat after eight p.m., not even a late night snack, if you want your digestive system to run well. The undigested food will just sit there throughout the night, and you’ll wake up feeling full and without energy. When your food is being properly absorbed, the nutrients in your foods are therefore getting into your cells, allowing for proper waste management. Mindful eating will improve your digestive system, leading to better overall health. Haas, E., et al, Staying Healthy with Nutrition: The Complete Guide to Diet and Nutritional Medicine (New York: Ten Speed Press, 2006), 392-393. Jensen, Dr. Bernard, Dr. Jensen’s Guide To better Bowl Care: A Complete Program For Tissue Cleansing Through Bowl Management (New York: Penguin Putnam Inc., 1999), 204-205. Mercola, J., “Which Oil Will Help You Absorb Nutrients Better?” Mercola.com web site, Aug. 20, 2012; http://articles.mercola.com/sites/articles/archive/2012/08/20/coconut-oil-and-saturated-fats.aspx. Whitmore, M., “How to Help Your Body Absorb Food,” Live Well – Jillian Michaels web site; http://livewell.jillianmichaels.com/body-absorb-food-4809.html.